in the depth of the night? that have escaped your mind? that line you’d never cross. Thanks! I write a lot on this same kind of topic- inner demons and such. I’ll be sure to check out your blog! Most of my work is metaphorical, usually aimed at humanity/society. Very rarely do I mean anything literally haha. It’s beautiful! 🙂 It’s true, the line of demarcation is nothing but a blur. I really enjoyed reading it! I’m glad you enjoyed it, thank you! And it really is. There’s a fine line and it can prove difficult to see where exactly it lies. Wow. This is so imaginative. Visually this is so good. Thank you! I found the image and loved it and felt like I needed to write something on it. The ending was originally the beginning actually. Then I read through it and thought it would work better for the ending so I tweaked it a little bit. I’m glad you liked it! This is fenomenal in my eyes! The best I read so far. Just referring to a comment that was made above – do you sometimes find that photos can inspire your work as well? Or do you usually just write from imagination? And I usually write from imagination then search for a photo to go with it. But I have been considering doing another installment of my interactive poetry, but with a photo instead of words. I’m just waiting until I have time. I was also nominated to do a 5 day photo challenge, I only had time to post one though. I’m probably going to link this to that challenge, but this photo just stood out to me and I wanted to write about it. If I find the courage to, I will credit you in the post, thank you 🙂 I’m glad you did too! haha it’s refreshing to see your creativity. Ah okay fair enough, I like the idea of linking photos of writing, essentially they’re just different ways of speaking to people aren’t they? I didn’t use to put photos with my poems, and I still don’t always do it. But I think they can provide the writing with more of an atmosphere. It’s like the photo tells some of the story and the words tell the rest. And what’s the link to your site? Every time I click on your profile it says it no longer exists. ❤ this and love the pic. I actually used this pic a few months back. I absolutely loved this picture. I happened to see It while searching for an image for another poem and I just had to write something on it. Great poem. And the image just magnifies its effect. Gave me chills, really. Thank you! I’m in love with this image. I saw it and had to write about it. I love the dark chill that dances beautifully through this poem. The accompanying image really hammers the mood of this work home. 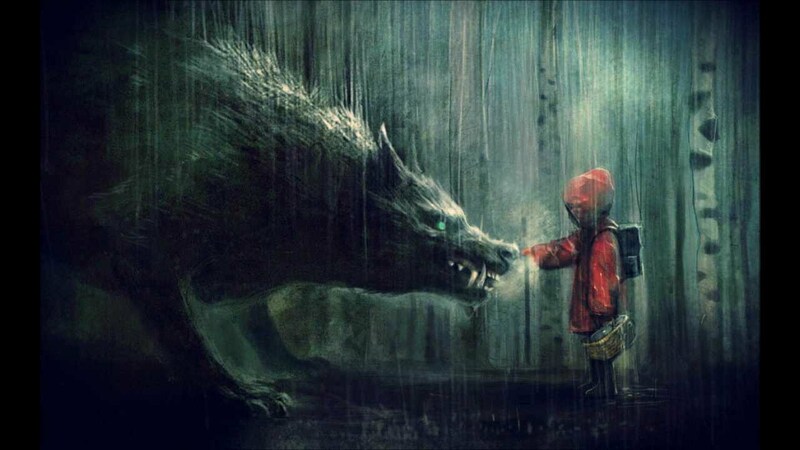 Is it sad that the first thought I had when seeing the photo was Bastian and the Nothing and not Little Red Riding Hood? Haha, I can definitely see that! Reblogged this on Psicofilosofía Moderna. This is a very thought-provoking piece Blair. Excellent work! I love the ending and the image you chose to accompany the piece. Thank you! I loved the image as well. I actually saw the picture and write a poem for it.